Have you ever heard the advice, spend 20% of your time creating content and 80% of your time marketing it? In recent years I’ve dished out this wisdom as well, but it’s actually dangerous advice. I believe the intent of this advice is sound — you’re not putting enough time into marketing, which is why you don’t have the audience you want. You should put in more energy to promote your work and reach new people, more than you probably do now. However, the risk is if you spend only 20% of your time creating content, what you publish won’t actually be very good. Then you will go out there and put 80% of your energy into marketing something that people won’t value. In this ‘Yaro Solo’ EJ podcast episode I address the issue of what exactly is good content, and what your content strategy should look like given entire libraries worth of information is uploaded online every minute of every day. At the start of this podcast, I take you through a brief introduction to the most famous concept I ever gave a label to – Pillar Content. From there, we look at how this term still applies today, and why focusing on this type of content can lead to a laptop lifestyle business. Content that delivers long-term stable traffic is one of the best forms of leverage available to online businesses. It’s free, it’s reliable, but it takes a heck of a lot of work to get started, and there are no shortcuts. 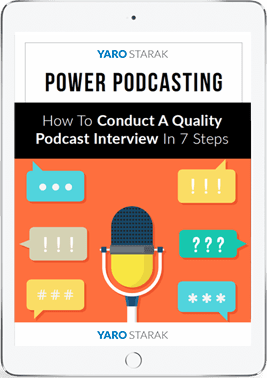 If you’re frustrated by your lack of traffic and you feel like your content is not performing as well as it should, listen to this podcast. I’m confident you will walk away with new insights that will help you craft an effective content marketing strategy for your business.